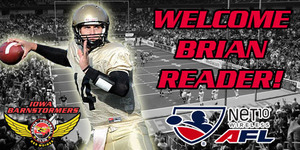 With just over two weeks remaining until the start of training camp, Iowa Barnstormers Head Coach and Director of Football Operations Mike Hohensee announced Tuesday afternoon that Quarterback Brian Reader has been assigned to the team for the 2013 season. With this latest addition, the Barnstomers have now been assigned 30 players for the upcoming season. Reader (6-3, 220) is a graduate of the University of Idaho, where he spent 3 seasons from 2009-2011. In 27 career games with the Vandals, he completed 281 of 506 passes for 4,144 yards and 27 touchdowns. His QB rating of 132.08 is the eighth best all time at Idaho. Reader transferred to Idaho after 1 season at Monterey Peninsula Junior College, where he was named conference player of the year and led his team to a 10-0 record. The Prunedale, California native was a star at Palma High School and was named the 2008 Monterey County Offensive Player of the Year.